It’s also used when someone encounters hardship that seems impossible to overcome. I feel like that a lot. Many mornings I wake up and feel like I’ll never get past the tidal wave of problems in my life. 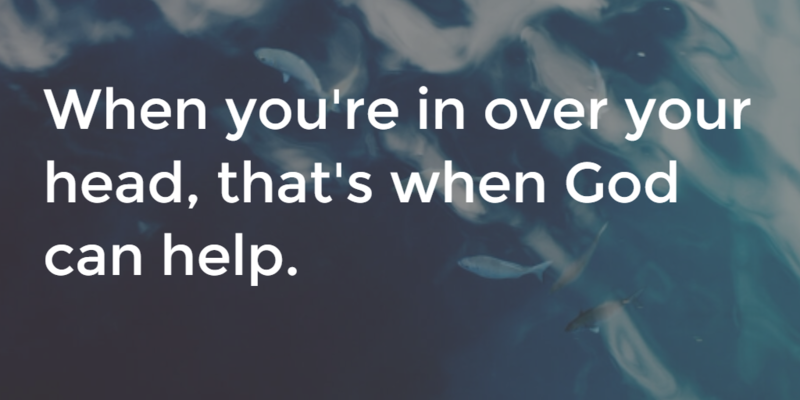 When you’re in over your head, that’s when God can help. Knowing that God’s love is “too wonderful to be measured” gives me hope. It gives me peace. It lets me know that even though I may not feel like God loves me right now, He does. Circumstances around me may make it appear that God has given up on me but I know that God is just one breath away. Do you ever feel in over your head? What comforts you in those times? It comforts me knowing, no matter how wrong life gets. Jesus had made it alright. When He returns is when we really know. I hate that I am limited to seeing and feeling the right now. It’s my faith that sees the “more than right now”. Truth. Thanks for commenting, Dave.